Mark Williams can have cable at his Fernside Street home in Lee, Massachusetts, but only if he pays Time Warner a $12,000 installation fee. Town officials are livid that Time Warner is demanding the exorbitant fee (as opposed to the typical $35 installation charge) because his home is roughly a half-mile away from the closest Time Warner Cable subscriber and approximately 300 feet from the nearest utility pole. The company has evoked the so-called “long-driveway” clause in the town’s license agreement, which Malcolm Chisholm—a Lee attorney and the town’s delegate to the local Cable Television Advisory Committee—says is being interpreted incorrectly. Chisholm claims the contract entitles all Lee homes to cable service if electric and telephone service are already available. The town has advised Time Warner it has 30 days to reverse its stance; otherwise it will begin taking money from the ten-thousand dollars Time Warner posted with Lee as part of its local license agreement. In a similar case in 2007, Time Warner agreed to drop its claim that a Lee homeowner pay $1,102 for cable installation, a decision which followed the town threatening the company with financial penalties. In addition to cable TV and telephone service, Williams says he’s also interested in Time Warner’s high-speed Internet. He says he’s willing to pay extra, but he won’t fork over $12,000. Supertanker Marine Knutsen dismasts yacht—Earlier this week the supertanker Marine Knutsen collided with a yacht as the 120,000 ton ship was being guided into Southampton docks. 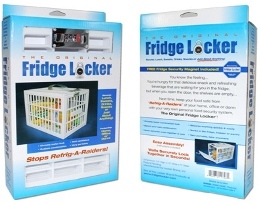 Fridge Locker—Looking for a way to keep co-workers, roommates, and friends out of your food?